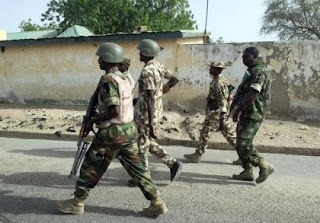 Alkasim Abdulkadir, Abuja: On July 9, the Nigeria military in Maiduguri, Borno State, handed over 184 child soldiers arrested while fighting on the side of insurgents to the United Nations. The Theatre Commander, Operational Lafiya Dole, Major General Nicholas Rogers, oversaw the hand over at a brief ceremony held at the Maimalari Barracks of the 7 Division in Maiduguri. In the last nine years of the conflict in North-east Nigeria, thousands of underage children have been coerced into fighting with the insurgents with many of them ending up as casualties. According to the United Nations Children Fund (UNICEF), more than 2000 children were engaged by Boko Haram in 2016 alone. Between January 2013 and December 2016, Boko Haram maimed, killed or used as child soldiers 12,850 children, the agency said. An estimated 2000 children have so far been released by the Nigerian Army to the Borno State Government and UNICEF. Ibrahim Cesay, the UNICEF senior child protection specialist who represented the UN humanitarian coordinator, Edward Kallon, disclosed that there are currently about 7,000 children in the agency’s reintegration programme. Major General Rogers, while handing over the 184 former child soldiers to the Borno State Government and UNICEF, said the children were rescued in various military operations around the North-east. He said the handover of the children was in line with the directive of the Chief of Army Staff, Lt. Gen. Tukur Buratai, on the treatment of arrested insurgents in accordance with international humanitarian laws concerning, arrest, interrogation and rehabilitation of suspects. He reiterated the commitment of the Nigerian Army and Nigeria as a country to protect the rights of children affected by armed conflicts in all ramifications, an expression of which was directive by the Chief of Army Staff to release the 184 children who have been in military custody. Said the Theatre Commander, “The Chief of Army Staff wants the Nigerian Army to collaborate with all relevant stakeholders and support in the areas of conflict, particularly in working closely with the UNICEF in handling over children affected by the armed conflict in the northeast. It is hoped that all these released children will be given a comprehensive and all-encompassing physical and psycho-social support they need before their reintegration into the larger society”. The representative of the Borno State Government, Fanta Babashehu, who is the Commissioner for Women Affairs, thanked the Nigerian Army for rescuing the vulnerable children. She said that the state government will admit all the children into the state rehabilitation centre manned by UNICEF, where they will be given all the support and care required to rehabilitate them and reunite them with their families. In an earlier statement, the UNICEF Representative in Nigeria, Muhammad Fall, said that the “eight girls and 175 boys are first and foremost victims of the ongoing conflict and their release is an important step on their long road to recovery.” He commended the military and the authorities, for handing over the children, an action which he described as “a clear commitment to better protect children affected by the ongoing conflict.” He said after having been held in administrative custody, the children will receive medical attention and psycho-social support before the process of reuniting them with their families and reintegrating them into society begins.